Who Says You Can Kill Americans, Mr. President? President Obama has refused to tell Congress or the American people why he believes the Constitution gives, or fails to deny, him the authority to secretly target and kill American citizens who he suspects are involved in terrorist activities overseas. So far he has killed three that we know of. Presidents had never before, to our knowledge, targeted specific Americans for military strikes. There are no court decisions that tell us if he is acting lawfully. Mr. Obama tells us not to worry, though, because his lawyers say it is fine, because experts guide the decisions and because his advisers have set up a careful process to help him decide whom he should kill. He must think we should be relieved. The three Americans known to have been killed, in two drone strikes in Yemen in the fall of 2011, are Anwar al-Awlaki, a radical Muslim cleric who was born in New Mexico; Samir Khan, a naturalized American citizen who had lived in New York and North Carolina, and was killed alongside Mr. Awlaki; and, in a strike two weeks later, Mr. Awlaki’s 16-year-old son, Abdulrahman al-Awlaki, who was born in Colorado. Most of us think these people were probably terrorists anyway. So the president’s reassurances have been enough to keep criticism at an acceptable level for the White House. Democrats in Congress and in the press have only gingerly questioned the claims by a Democratic president that he is right about the law and careful when he orders drone attacks on our citizens. And Republicans, who favor aggressive national security powers for the executive branch, look forward to the day when one of their own can wield them again. But a few of our representatives have spoken up — sort of. Several months ago, Senator Patrick J. Leahy, Democrat of Vermont and chairman of the Judiciary Committee, began limply requesting the Department of Justice memorandums that justify the targeted killing program. At a committee hearing, Attorney General Eric H. Holder Jr., reminded of the request, demurred and shared a rueful chuckle with the senator. Mr. Leahy did not want to be rude, it seems — though some of us remember him being harder on former President George W. Bush’s attorney general, Alberto R. Gonzales, in 2005. So, even though Congress has the absolute power under the Constitution to receive these documents, the Democratic-controlled Senate has not fought this president to get them. If the senators did, and the president held fast to his refusal, they could go to court and demand them, and I believe they would win. Perhaps even better, they could skip getting the legal memos and go right to the meat of the matter — using oversight and perhaps legislating to control the president’s killing powers. That isn’t happening either. Thank goodness we have another branch of government to step into the fray. It is the job of the federal courts to interpret the Constitution and laws, and thus to define the boundaries of the powers of the branches of government, including their own. In reining in the branches, the courts have been toughest on themselves, however. A long line of Supreme Court cases require that judges wait for cases to come to them. They can take cases only from plaintiffs who have a personal stake in the outcome; they cannot decide political questions; they cannot rule on an issue not squarely before them. Because of these and other limitations, no case has made it far enough in federal court for a judge to rule on the merits of the basic constitutional questions at stake here. A pending case filed in July by the families of the three dead Americans does raise Fourth and Fifth Amendment challenges to the president’s killings of their relatives. We will see if the judge agrees to consider the constitutional questions or dismisses the case, citing limitations on his own power. In another case, decided two weeks ago, a federal judge in Manhattan, Colleen McMahon, ruled, grudgingly, that the American Civil Liberties Union and two New York Times reporters could not get access, under the Freedom of Information Act, to classified legal memorandums that were relied on to justify the targeted killing program. In her opinion, she expressed serious reservations about the president’s interpretation of the constitutional questions. But the merits of the program were not before her, just access to the Justice Department memos, so her opinion was, in effect, nothing but an interesting read. So at the moment, the legislature and the courts are flummoxed by, or don’t care about, how or whether to take on this aggressive program. But Mr. Obama, a former constitutional law professor, should know, of all people, what needs to be done. He was highly critical when Mr. Bush applied new constitutional theories to justify warrantless wiretapping and “enhanced interrogation.” In his 2008 campaign, Mr. Obama demanded transparency, and after taking office, he released legal memos that the Bush administration had kept secret. Once the self-serving constitutional analysis that the Bush team had used was revealed, legal scholars from across the spectrum studied and denounced it. While Mr. Obama has criticized his predecessor, he has also worried about his successors. Last fall, when the election’s outcome was still in doubt, Mr. Obama talked about drone strikes in general and said Congress and the courts should in some manner “rein in” presidents by putting a “legal architecture in place.” His comments seemed to reflect concern that future presidents should perhaps not wield alone such awesome and unchecked power over life and death — of anyone, not just Americans. Oddly, under current law, Congress and the courts are involved when presidents eavesdrop on Americans, detain them or harshly interrogate them — but not when they kill them. It is not just the most recent president, this one and the next whom we need to worry about when it comes to improper exercise of power. It is every president. Mr. Obama should declassify and release, to Congress, the press and the public, documents that set forth the detailed constitutional and statutory analysis he relies on for targeting and killing American citizens. Perhaps Mr. Obama still believes that, in a democracy, the people have a right to know the legal theories upon which the president executes his great powers. Certainly, we can hope so. After all, his interpretation might be wrong. Vicki Divoll is a former general counsel to the Senate Select Committee on Intelligence and former deputy legal adviser to the C.I.A.’s Counterterrorism Center. I have spent over 40 years of my life at war. I was born minutes before Sudanese soldiers gunned down the leaders of my village in South Sudan and I spent the first week of my life hiding in the jungle with my mother. I became a child soldier thirteen years later and survived only by the grace of God. In the years since, I have worked to seek peace as a chaplain for the Southern rebels and now as the head of the Sudan Evangelical Alliance and the Sudan and Uganda Evangelical Presbyterian Church. Too many people have died in my country, but millions more would have died if the American people and churches had not sent aid and put pressure on Khartoum to negotiate peace with the Southern rebels. The U.S. helped South Sudan gain independence about a year ago. But we need continued involvement from our American brothers and sisters to ensure our nation survives its infancy. My life’s prayer is that we turn our swords into ploughs and instead of digging graves we dig wells and build foundations for hospitals. But over the last year, the leaders of Sudan and South Sudan have remained locked in political disputes that have resulted in violence along our shared border and a growing economic crisis. South Sudan has the majority of the region’s oil, but the pipelines to ship it pass through Sudan. This mutual dependence on oil revenue could help build cooperation between north and south after independence. Instead oil has become a weapon both sides use to harm the other. After Khartoum unilaterally seized southern oil in lieu of transport fees that the two countries had failed to agree on, South Sudan decided to halt oil production in January. It was a bold move, but it was justified: Khartoum benefited from southern oil for years even as it marginalized the south. But even when one is in the right, justice and revenge can become easily confused. There must always come a point where we look forward and recognize the need to stop fighting over past wrongs so we can build toward a new future. That time has come for South Sudan. We must restart oil production and work out an agreement to transport it through north Sudan. But we will need international support and pressure on Khartoum if that plan is to succeed. This month, the two parties met in Addis Ababa to negotiate a new oil deal, but yet again could not reach an agreement. Without outside intervention or pressure from the U.S., it seems unlikely that the two sides will reach a settlement ahead of the August 2 deadline set by the United Nations. The cessation of southern oil production and export has hurt both countries and weakened our fragile peace. The region has lost its primary funding stream. South Sudan has seen nearly 80 percent inflation. Families are struggling to get by, and half of the South Sudanese population faces food shortages. All the progress the country has made over the last year on education and health is grinding to a halt as funding runs dry. This is not how it should be. Both Sudan and South Sudan are blessed with fertile lands created by two rivers that join to form the Nile. We should be the breadbasket of Africa and a model for cooperation between the Middle East and Africa. The U.S. should use its leverage in Sudan and South Sudan to help the two countries come to an agreement on transparent oil transportation fees. We also need international help in finalizing the boundary between Sudan and South Sudan. And we need help from the government, NGOs, and church friends in the U.S. to ensure that the vast humanitarian needs in South Sudan are met as the world’s newest nation continues to develop its enormous agricultural potential. America has been an ally throughout our struggles, and I don’t think there is a country in the world that loves Americans more than South Sudan. My faith teaches that suffering and strife may last the night, but joy and peace come with the dawn. I still believe we will build schools, homes, and communities, and that my children can grow up without experiencing the violence and strife that have defined my life. I am asking that America continue to walk this road with us as we seek a new dawn for our region. Bishop Elias Taban holds a Diploma in Civil Engineering and an advanced Diploma in Theology. 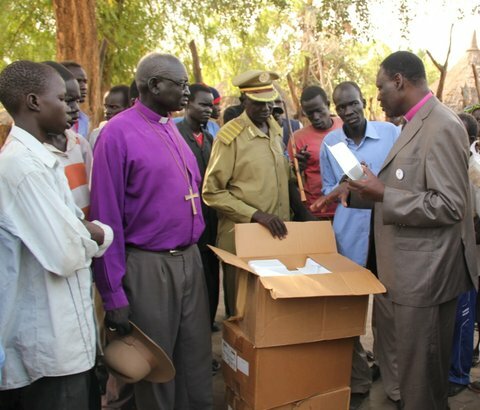 He works as a mentor to many in the South Sudanese government and was one of the few senior religious leaders to have stayed in South Sudan during the long north-south conflict. President Barack Obama has the stuff and what it takes to be a great American president; and the possibility of having his image chiselled on Mount Rushmore with other great presidents. Obama is tenacious, strategic, brilliant and politically astute to join the family of American greatest presidents. But he should be ready to walk the difficult but established pathway to greatness. For him to accomplish such a tall order he must be willing to think long term and forsake immediate gratification of winning immediate elections. The November mid- term election is almost here and polling numbers coming in are not very good for the Democratic Party. Well, history has proven that mid-term election is not always good for the ruling party. But to make the sour soup worse, the great recession that comes with increasingly unemployment is not making life easy for President Obama and his fellow democrats on the campaign trail. Real politicking would be for the White House to tactically recoil from its agenda of transforming American economy. It may help them in short term to win November election and continue to maintain the majority in both Houses. But dwelling on winning immediate election at the expense of planned agenda will make the American prospect little dimmer. This is not to say that Democrats will rest on their laurels and give up in maintaining their majority in both houses. All things being equal, this is not the time to back down from laying the necessary foundation for the creation of new industries and policies that will produce 21st century jobs and the innovative green energy industries. It will be a total disservice to the children and next generation of American workers when policy makers and industrial leaders fail to prepare them for jobs of 21st century. President Obama has a great challenge even perhaps the greatest dilemma of his political life. To do the political correct and popular things, thereby win elections. In other hand do the right and difficult things and suffer the consequences of losing seats in the both houses. The right decisions and policies will make American Union richer and stronger. To make these strategic decisions President Obama has plenty of places to look to especially through the prism of American history. History has proven that nation building and growing of economies of the future never happen by chance. The world can be changed and things get better when men and women of goodwill made firm decisions to be committed and consistence to a strategic vision. The “translating of strategic vision to operational reality” cannot be possible when tactical decision hinders politicians for short-term political gains. History was littered with great men and women who took up the consequential challenge of making lives better by changing the course of history. Looking into American past the great presidents can be a case study for President Obama and politicians who are willing to rise above politics and make the right decisions. The brilliant, young and charismatic President John Kennedy stood on the right side of history in spite of the pitfalls. JFK did the right thing and stood up for civil rights and he did not think about losing elections in the South, rather he was thinking about the future of the republic. The strategic vision of making American freer and more prosperous for everybody is more significance than winning elections in short terms. President Kennedy was looking at the future when he pledged to land a man on a moon and return him back successfully. President Reagan at era of cold war increased the defence budget despite criticism and his contributing endeavor catalyzed the end of cold and the defeat of Soviet Union. President Eisenhower pushed the bill for the intercontinental Highway constructions and today America is better and richer because of his vision. The bulging of commerce and trade would have been hampered without the easy access for deliverance of goods and services in every nook and corner of the country. Probably the greatest president of modern time is Franklin Delano Roosevelt (FDR) who gave America the New Deal “a complex, interlocking set of programs designed to produce relief (especially government for the unemployed), recovery (of the economy), and reform (through regulation of Wall Street, banks and transportation).” America is healthier and stronger because of FDR’s New Deal. Time and events, it is said, makes a great president. President Obama during this changing time of the global economy should look into American history for courage and determination to continue with what he has started - which is to transform America for sake of the next generation of workers and capitalists.